Raw Exporter utility batch exports image files stored in RAW format into jpeg file formats. 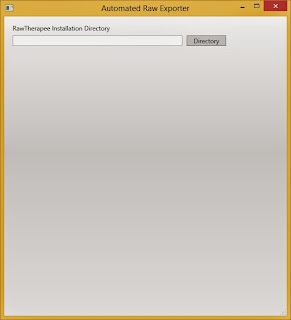 It automates RawTherapee application in doing so - so actually it is capable of converting all file formats supported by RawTherapee which are following file formats: 3fr, arw, cr2, crf, crw, dcr, dng, fff, iiq, jpg, jpeg, kdc, mef, mos, mrw, nef, nrw, orf, pef, png, raf, raw, rw2, rwl, rwz, sr2, srf, srw, tif, tiff. Main purpose of Raw Exporter application is to once set up application and then by click of one button automatically export all new image files. It is possible to set up storage limit so if exported files exceed that limit older ones are deleted. This feature is designed to support storage limited devices - e.g. export only new RAW files for review on a tablet. Installation package can be downloaded here. There can be specified multiple export definition. 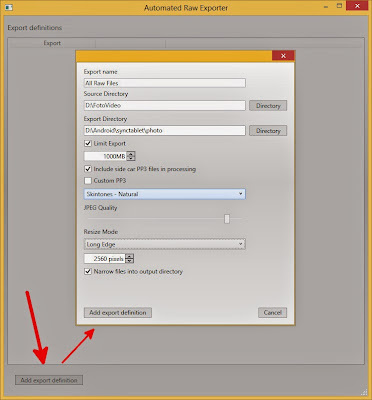 Export can be started by clicking on Run exports button.